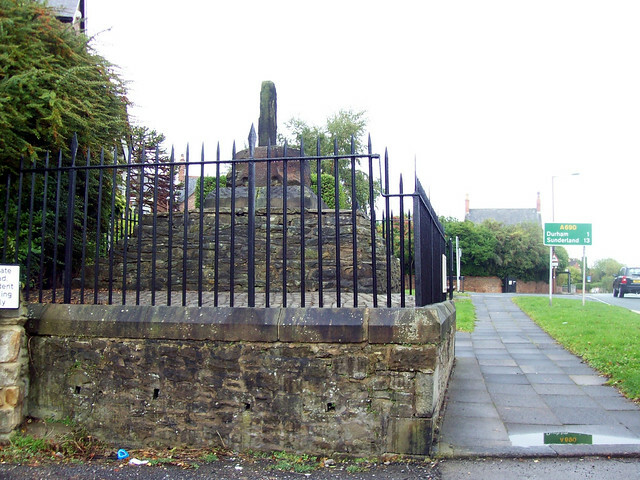 The Battle of Neville's Cross took place close to Durham on 17 October 1346. King David II of Scotland invaded the north of England, whilst most English forces were occupied with the Hundred Years' War with France. However, the battle ended with the rout of the Scots and the capture David II by John de Coupland. The Battle of Neville's Cross took place less than half a mile to the west of Durham, England, on 17 October 1346, within sight of the Cathedral. The battle was the result of the invasion of France by England whereupon, under the terms of the Auld Alliance, the Scottish invasion of northern England was required during the Hundred Years' War and the Second War of Scottish Independence. The battle ended with the rout of the Scots and the capture of their king, David II of Scotland. Notwithstanding the Scottish defeat, this sacrifice is generally regarded as crucial to the longer-term goal of securing English recognition of Scottish independence. In 1346, England was embroiled in the Hundred Years' War with France. In order to divert his enemy, Philip VI of France appealed to David II of Scotland to attack the English from the north in order to create a second front for the English. The request from Philip VI came during an unstable time in the reign of David II. The English crown under Edward III did not recognize David II’s authority, instead supporting the compliant Balliol cause in the hope of re-establishing dominance over Scotland. The young king had only returned from Château Gaillard in Normandy 5 years previously at age 17 after having to flee after his father’s death. The treaty of Edinburgh of 1328 had cemented Scotland’s independence under Robert I’s rule only to fall apart with his death in 1329 and had still not been reestablished by David II's return in 1341. Despite Philip VI's especially desperate pleas in June 1346, two months before the French defeat at Créci, (when the English were amassing troops in southern England), David II of Scotland waited until October, when he felt few English troops would be left to defend lucrative Northern English cities. Waiting until he believed most English troops were fighting France and with winter approaching, David II of Scotland invaded England as a response to England's invasion of France. On 7 October, the Scots invaded England with approximately 12,000 men. They were expecting to find northern England relatively undefended because Edward III was by then conducting a major campaign in France. After taking Liddesdale (and bypassing Carlisle after being paid protection money), the Scots moved on toward their ultimate goal of Durham and Yorkshire after more than a week's march. Along the way, they sacked the priory of Hexham and burned the territory around their line of march. They arrived at Durham on 16 October and camped at Beaurepaire, where the Scots were offered £1,000 (£ as of ) in protection money to be paid on 18 October. Without the Scots' knowledge, however, the English had already arrayed troops for just such an invasion. Once the Scots invaded, an army was quickly mobilised in Richmond under the supervision of William Zouche, the Archbishop of York. 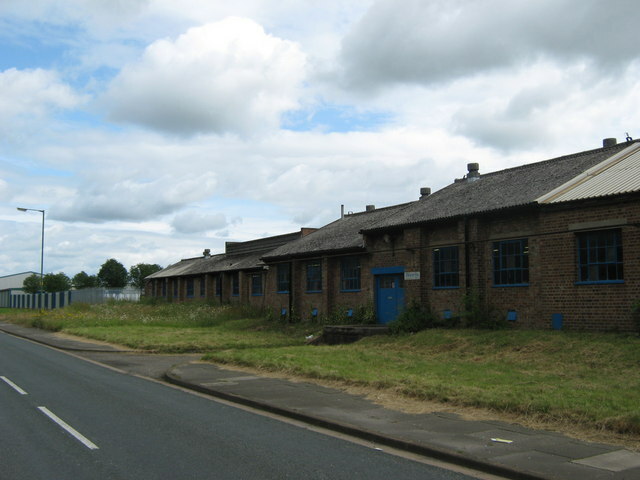 It was not a large army and what men were available were split into two separate groups: 3,000–4,000 men from Cumberland, Northumberland and Lancashire, with another 3,000 Yorkshiremen en route. Given the demands of the Siege of Calais, no further men could be summoned for the defense of Northern England. Worse still, on 14 October (while the Scots were sacking Hexham), the Archbishop decided not to wait for the Yorkshire men and made haste toward Barnard Castle. After camping at Beaurepaire, the Scots only discovered the presence of the English army on the morning of 17 October. Around 500 troops under command of William Douglas stumbled upon them in the morning mist during a raid south of Durham around Merrington. The two rearward divisions of the English army drove the Scots off with heavy Scottish casualties of around 300. Douglas raced back to David II's camp awakening the rest of the troops as he did. During this time, two black monks arrived from Durham in an attempt to broker peace but David II, thinking they were spies and false priests, ordered their beheading which was not carried out as the two monks escaped during the chaos. David II led the Scottish army to high ground at Neville's Cross (site of an old Anglo-Saxon stone cross), where he prepared his army for battle. Both the Scots and English arranged themselves in three battalions. On the Scottish side, King David II took control of the second unit, and placed John Randolph, the Earl of Moray, in charge of the first unit and Patrick Dunbar, the Earl of March, took possession of the third unit after refusing to command the first unit. The English divided their forces under Sir Henry de Percy, Sir Thomas de Rokeby, and William Zouche, the Archbishop of York commanding the first, second and third units respectively. 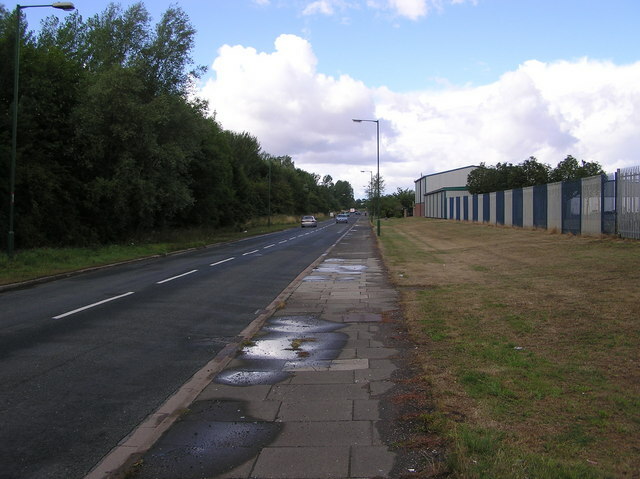 Though the Scots were in what is considered a rather poor position (with various obstacles between them and the English position), they remembered well their defeats in the Battle of Dupplin Moor and the Battle of Halidon Hill and thus took a defensive stance, waiting for the English to attack. The English also took a defensive stance, knowing they had the superior position and likely knowing that time was on their side. The resulting stalemate lasted until the afternoon, when the English sent longbowmen forward to harass the Scottish lines. The archers succeeded in forcing the Scots to attack, but their initial hesitation in going on the offensive appears in hindsight to have been the correct decision. The Scots' poor position resulted in their formations falling apart as they advanced, allowing the English to deal easily with the Scottish attack. they led the dance, leaving David to dance his own tune. After three hours of intense fighting, the king's own battalion attempted to retreat, but was unsuccessful and David II was captured after he fled the field, while the rest of the Scottish army was pursued by the English. Scottish chroniclers Andrew of Wyntoun and Walter Bower both wrote that 1,000 Scots were killed in the battle, while the Chronicle of Lanercost said that "few English were killed". Chris Given-Wilson and Françoise Bériac estimate that some 3,000 Scotsmen perished while only less than 100 were actually taken prisoner. David II initially managed to escape. However, legend has it that, while he was hiding under a bridge over the nearby River Browney, David’s reflection was spotted in the water by a detachment of English soldiers that was out searching for him. David was then captured by John de Coupland the leader of the detachment. During the battle David II was twice shot in the face with arrows. Medical surgeons attempted to remove the arrows but the tip of one remained lodged in his face rendering him prone to headaches for decades. Later, King Edward III ordered Coupland to hand him over. Edward then rewarded Coupland with a knighthood and a handsome annuity of £500 for life. Thomas Rokeby, Sheriff of Yorkshire was responsible for transporting David II from Coupland’s custody to the Tower of London. King David was then imprisoned at Odiham Castle (King John's Castle) in Hampshire from 1346 to 1357. King Edward III offered to release David II on three separate occasions for an amount around £40,000 if the childless David II accepted one of Edward III’s sons as his heir to the Scottish throne. All three of these initial offers were refused. Eleven years later, he was released in return for a ransom of 100,000 marks (approximately £15 million in 2006). The ransom was to be paid over a ten year span on 24 June (St. John the Baptists Day) during which an Anglo-Scottish truce would prevent any Scottish citizen from bearing arms against Edward III or any of his men. This truce proved to be effective for about four decades after the battle itself. The Scottish defeat at Neville’s Cross also effectively ended the Bruce-Balliol conflict placing the Bruces with the legitimate right to the crown. Scotland's independence and that of France continued. 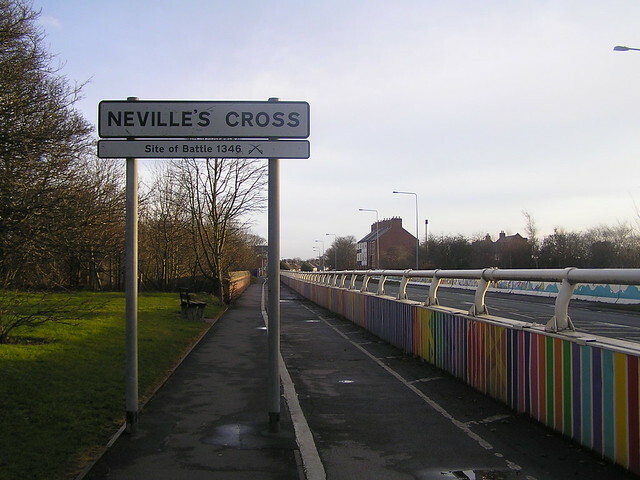 The Battle of Neville’s Cross derives its name from a stone cross that was on the property. After the victory, Lord Ralph Neville paid to have a new cross erected on the battlefield to commemorate the day. 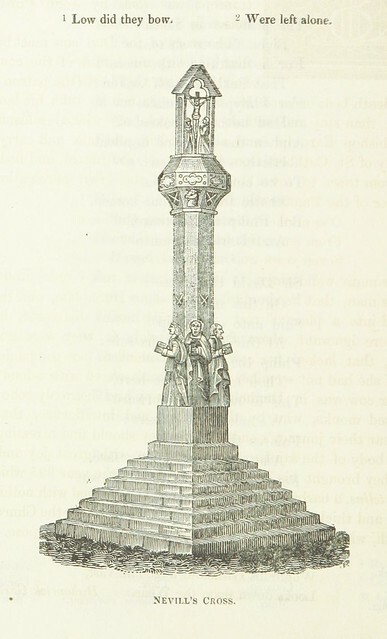 According to Lynda Rollason, the Black Rood, a piece of the True Cross formally belonging to former Queen of Scotland St. Margaret was taken from David II and donated to the shrine of St. Cuthbert. The last lines refer to an earlier play that would have been known to Shakespeare's audience, The Reign of Edward III, at the end of which John de Coupland brings over the captured David to Edward III in Calais, where he meets up with the Black Prince who has captured the French king (hence "prisoner kings"). Though these two events in fact occurred ten years apart, the play portrays them as contemporaneous. Text from Wikipedia, available under the Creative Commons Attribution-ShareAlike License (accessed: 24/11/2017). 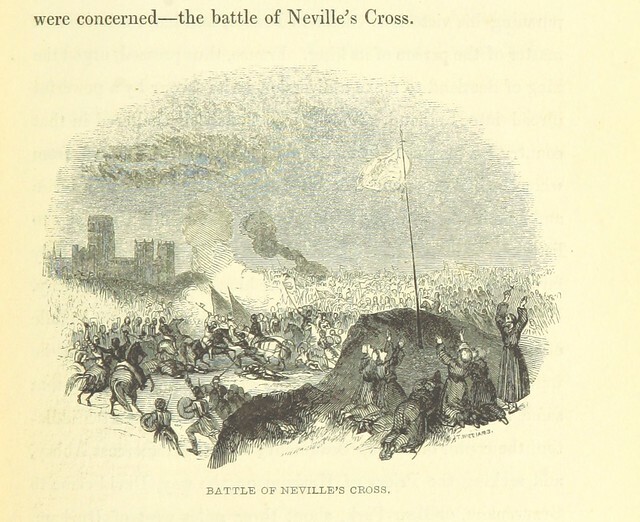 Visit the page: Battle of Neville's Cross for references and further details. You can contribute to this article on Wikipedia. Image taken from page 516 of 'The Local Historian's Table Book of remarkable occurrences, historical facts, traditions, legendary and descriptive ballads, connected with the Counties of Newcastle-upon-Tyne, Northumberland, and Durham. Historical Division.